Although, The Abduction from the Seraglio is not likely to be the first Mozart opera that would come to most people’s minds, it was Mozart’s most popular work in his lifetime. Opera Atelier’s stunning 2013 production of this work served as a potent reminder for modern day audiences as to why this work delighted audiences of Mozart’s time. During the overture, noble woman Konstanze and her personal maid Blonde are abducted by marauders working for Arab prince Pasha Selim. Their lovers, Belmonte and Pedrillo, embark on a rescue mission and hilarity ensues. I will not belabour discussion of the problems inherent in a plot revolving around the abduction of nice white women by Arab pirates translated into the modern day. Nor will I elaborate at length on the fact that a modern day staging of this production will inevitably involve numerous white performers decked out in Arabian regalia. I will say, that although times have changed since 1782, it is clear that Mozart and librettist Gotlieb Stephani were trying to accomplish something fairly class, race and gender subversive for their day. My companion noted that although the premise of the production is very colonialist, many of the expected tropes are turned on their ear when the comedy resolves. One has to applaud Atelier’s unwavering commitment to historically informed performance practice. The roles fit the performers like the proverbial glass slipper. Tenor Lawrence Wiliford, who sang the role of Belmonte, has an instrument that is tailor made for Mozart. His voice is light, dulcet, supple and rich with pathos. I have now had the good fortune to hear Ambur Braid (Konstanze) sing on several occasions and it is not hyperbole to describe her voice as a natural wonder. One would be hard pressed to find a coloratura role in the repertoire more challenging than this one and yet Ms. Braid managed to make the extremely intricate singing seem effortless. The two couples also had fantastic onstage chemistry. Writing jokes such that they continue to be funny more than two centuries later is no mean feat. All of the performers, in addition to being amazing singers, demonstrated an exceptional flare for comedic timing. 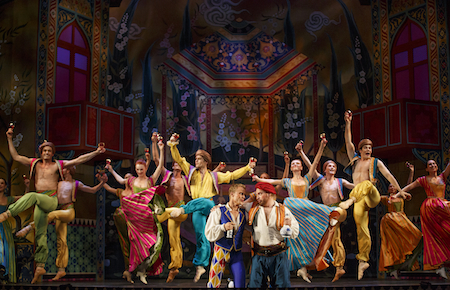 Gustav Andreassen was especially side-splitting in the role of Osmin, the harem guard. One of the best aspects of Atelier’s commitment to a historically informed approach is that their productions also feature spectacular use of ballet. Without a doubt the best dance number in the show was the choreography during the aria in which Pascha Salim menaces Konstanze with the threat of torture. The dancers, as the servants of the prince, brandish various torture devices, including floggers and metal pincers, while closing in on Konstanze. Words actually cannot describe the hilarity of watching someone be threatened with lithe, graceful ballet. Add to all of this a sumptuous, Arabic mosaic themed set, as well of some of the most vibrantly colourful and arresting costumes I have ever seen and you have all the elements of a breathtaking and laugh-out-loud funny night at the theatre. This Mozart comedy would also make an excellent introduction to the genre for an opera novice. Ticket prices range from $45 – $189. Patrons under 30 can purchase tickets from $24. Photo of Adam Fisher, Gustav Andreassen and the Artist of Atelier Ballet by Bruce Zinger.